Minerals like molybdenum, copper, iron and kyanite form the foundation of our nation’s roads, bridges, railroads, highways, buildings, construction equipment and many important alloys. Without an abundant and stable supply of minerals, plans to rebuild and reinforce our infrastructure will not be possible. Kyanite Mining Corporation, the world’s largest and oldest producer of kyanite in the world and the world’s only supplier of Virginia Kyanite™ and Virginia Mullite™ stands ready to provide the raw materials America needs to help rebuild its infrastructure for a stronger future. Family owned and operated in Dillwyn, Va., for more than 70 years, customers around the globe depend on Kyanite Mining Corp. for consistent, high quality products. Kyanite and mullite is used to manufacture a wide range of products of refractory materials. Refractory materials are those that are resistant to very high temperatures. 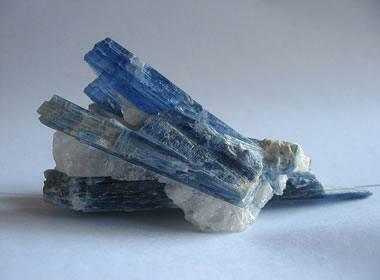 As a result, more than half of the kyanite consumed is used in refractories to produce steel. In 2016, 90 percent of kyanite transformed into mullite was used by refractories. Today, kyanite is commonly used in many electronics – from electrical insulators to spark plugs. Kyanite Mining Corp. can produce more than 150,000 tons of commercial grade kyanite concentrate every year, which will be necessary in rebuilding our failing infrastructure and developing innovative, new projects.